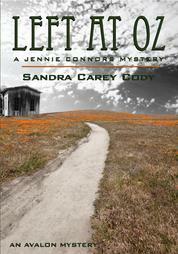 Jennie Connors's exploits take place in a fictional county just north of Memphis, Tennessee. These stories are fun to write because I enjoy spending time with the people who inhabit them: Jennie, a young mother, sometimes too impulsive for her own good; Tommy and Andy, her intrepid sons; Nathaniel Pynchon, a retired actor, who'll do almost anything to occupy the spotlight; and the Tea Ladies, six elderly women, made of much more spice than sugar. 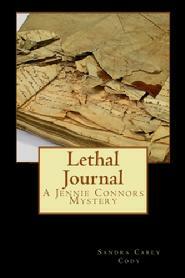 Lethal Journal is the latest Jennie Connors book. How will Jennie deal with the changes coming her way? Jennie has been promoted out of the job she loves. But there's one thing she wants to do before she moves into her new position: Jake Appleton, known throughout Riverview as Sour Appleton, needs to be integrated into the retirement community's social life. It won't be easy. Jake spends his days alone, staring out the window and mumbling that the world is full of crooks. Has he witnessed wrongdoing in the construction project going on outside his window? Or is he looking back over his own life. Jake's not telling. He shares his thoughts only in his journal. Jennie doesn't give up - and, finally, one morning Jake surprises her. He taps the journal, says "it's all in here" and agrees to talk to her later that afternoon. But someone else gets there first. Jennie finds Jake with a bullet in his head. The journal is gone - and Jennie is determined to find it and solve the puzzle of a lonely old man and restore peace of mind to the residents she loves. If you've read any of the other Jennie Connors books, you won't be surprised to learn that the residents insist on becoming involved. I was delighted to have the input. Few things make a writer as happy as hearing from a reader. 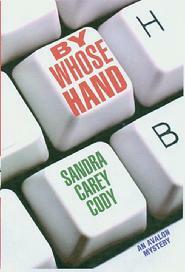 Jennie Connors is crazy about her handsome husband, but she dreads his reaction when she tells him her car was stolen. When she finds a message hinting that the vehicle was left at Oz, she jumps at the chance to find the car before he returns from the West Coast. Following directions given in the message, Jennie finds the car. Problem is - there's a body in it. It gets worse. Turns out the victim is Robin Langley, babysitter for the Connors' two young sons. What motive could anyone have for killing Robin? Why steal the Connors' car to hide the body, then leave a message directing Jennie to it? 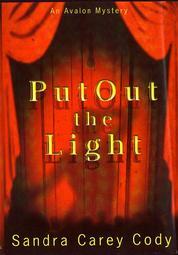 Jennifer Connors, the activities director of Riverview Manor, is working late one night when she hears resident Nathaniel Pynchon pleading, "Put out the light." Following Nate down a darkened corridor, Jennie discovers the body of Rosalie Cardamon. Everyone at Riverview assumes the former actor has finally slipped over the line separating fantasy from reality and committed murder. Only Jennie believes him innocent. But if it wasn't Nate, who was it? When Jennie learns that wounds left by a thirty-year-old accident are still festering, she wonders if Rosalie's death could be related. Unfortunately, the police are too busy investigating Nate to care. Jennie Connor’s friend, Lilly, is in big trouble. Two patrons are poisoned while dining at her restaurant. The police are busy with crowd control and don’t notice a shadowy figure climb down the arbor and slip away. Jennie watches and wonders if Lilly’s daughter, Jasmine, is up to her usual teenage mischief. Or is it something more sinister? While the press focuses on one of the victims, Phillip Jeffries, a junior high principal who’s made a lot of enemies during his career, Jennie learns that the other victim, teacher Leonard Atkinson, has his own dirty little secret. When Preston Barrons hands Jennie Connors the key to Barrons Bank and Trust Company and asks her to pay a 2 a.m. visit, her instinct screams "give them back!" But how can she, when her paycheck depends on finding out who made an unauthorized transfer? Money from a recent fundraiser has ended up in the account of Webster Barrons and the family is hoping Jennie can clear their son's name. Instead of answers, Jennie stumbles over the body of Preston's right-hand man. She goes looking for the security guard, but he finds her first and assumes she's trying to sneak out. It seems the only way extricate herself from bank politics is to find the killer.